Were the Recessions of 2000 and 2008 Both Caused by Easy Money? It is common for pundits to declare that the last two recessions were due to easy money on the part of the Federal Reserve. Both free market proponents, such as Austrian economists, and Keynesians agree on this point. David Faber even did a one hour show called the “Bubble Decade.” First, let’s distinguish between easy credit bubbles and investment manias. The recession of 2008 was clearly the result of excessive debt and is therefore a credit bubble. Not only did the Federal Reserve hold interest rates low, but more importantly the federal government pursued a number of policies to encourage overinvestment (borrowing) in the housing sector. Among these policies were the creation of Fannie and Freddie Mac and their investment in subprime mortgages and debt rating agencies, sanction by the SEC, that rated securities based on these mortgages as AAA. Both of these contributed to a false sense of security on the part of investors. It was believed that even if these securities (CMOs) failed the government would stand behind any mortgages backed by Fannie and Freddie. Now compare this to the recession of 2000. There were no policies encouraging debt (or equity) investments in technology start-up companies. Banks do not loan money to even highly successful technology start-up companies. Even very accommodative money policies by the Federal Reserve do not result in direct loans to these companies. The Fed has small indirect effects. For instance, easy money by the Fed makes it easier for founders to mortgage their house (or other property) and invest in their start-up. Another indirect effect is that lower interest rates make it more attractive to invest in technology start-ups than debt instruments. A third indirect effect is low interest rates encourage margin accounts for stock investors. As a result, it is unlikely that the investment mania of the late 90s was the result of easy money policies on the part of the Fed. Some people seem to believe that manias and bubbles can only occur because of easy money policies on the part of the Federal Reserve (Central Bank). This cannot be right, because the tulip mania of Holland reach its peak in 1623. This was before fractional reserve banking. The first fractional reserve bank was the Swedish Riksbank established in 1656. The first central bank was not established until the next century. Clearly, investment manias can occur without central bank. Gold is one of the most sensitive barometers of inflation due to excessive money creation. 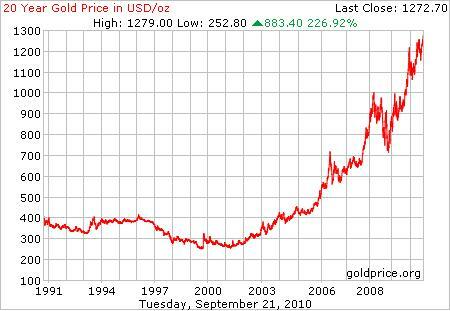 The price of gold fell from about $400.00 an ounce in 1996 to below $300.00 per ounce in 1999 and most of 2000. This is not the sort of response we would expect in gold prices, if the Federal Reserve was inflating the money supply. The Discount Rate was 4 ½% in November 1998 and was increased to 6% by May 2000. Again this is not one would call an easy money policy. The investment mania in technology companies in the late 90s was not the result of over inflating the money supply. Part of the deflation of the late 90s was due to a rapid increase in the amount of goods and services being produced, due to the new technologies being developed. This may be one of the cases where the GDP measurement actually understated the actual growth. The recession of the 90s was not caused by too easy money, but imprudent tightening of the money supply. Alan Greenspan was determined to cool the stock market. As a result, the Fed increased interest rates until they caused a recession. The yield curve turned negative 1999 or early 2000. A negative yield curve would never occur in a free market economy – that is without a central reserve bank. No one would ever loan out money for a longer term at a lower interest rate in than a shorter term loan. An inverted yield curve is the product of a central bank. The economic growth of the 90s was built on companies developing new technologies, which is the only way to increase real per capita income. As a result, the recession of 2000 was relatively mild. Alternatively, the housing bubble was built on easy credit and did not result in new technologies. The recession of 2008 was the deepest since the recession of 1980.